Drawing inspiration from the Musica Secreta which flourished in the Ferrara court under Alfonso d Este, and the fascinating secret lives of the singers and composers that thrived in the Florentine, Venetian and Roman courts, singers Maira Milolidaki, Natassa Angelopoulou and Effi Minakouli travel in 17th century Italy and explore the vocal music composed by female composers or for female singers by Luzzascho Luzzaschi, Claudio Monteverdi, Salamone Rossi, Sigismondo d’ India, Girolamo Frescobaldi, Francesca Caccini, Luigi Rossi, Girolamo Kapsberger and Barbara Strozzi. They are accompanied by Katerina Ktona at the harpsichord. Guest artist Diane Sutherland. Each member of the Canto Soave vocal ensemble has for many years followed her own distinctive path in various branches of music and musical theatre, exploring a wide range of repertoires and styles. 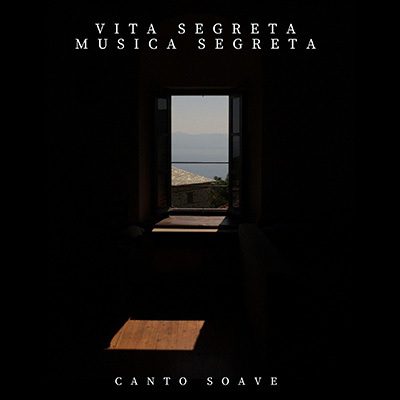 Following many fruitful collaborations Canto Soave was created out of its members’ love for the beauty of the harmonious sound produced by female voices in the works of the most prominent composers of the Renaissance and the Baroque periods. Equally interested in contemporary musical idioms, they also work with young composers specializing in electroacoustic composition. 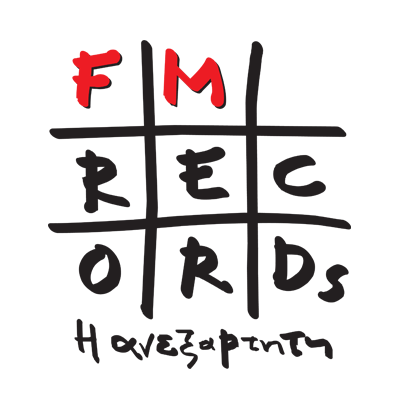 The recording is the result of our collaboration with the music producer Bruno Libert whom we thank for recording, editing and mastering the CD. 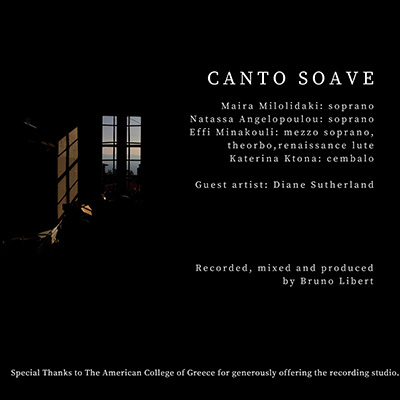 We would also like to thank The American College of Greece and professor Leslie Jones, Head of the Music Department of the School of Fine and Performing Arts Frances Rich of Deree, for generously offering the college’s recording studio, as well as our colleague Dr. Tim Ward and o Chris Papadopoulos for their valuable assistance during the days of the recording. We are especially grateful to Nefeli Beri for the design of the cover. Natassa studied choral conducting, classical singing, violoncello, piano and accordion, obtaining the highest distinctions and first prizes for all her diplomas. With a scholarship from IKY she continued her studies in the Music Department of the Ionian University from where she graduated with a degree in Orchestral Conducting, earning the highest grade and a first prize. She furthered her studies with a postgraduate course in orchestral conducting, earning a first class Master’s degree with distinction. She has participated in singing workshops with the Bach Academy under the direction of Helmut Rilling. As a soloist she has collaborated with the Symphonic Orchestra of ΕRΤ, the National Orchestra of Thessaloniki, the Camerata, the Orchestra of the University of Athens and other orchestral ensembles, performing works such as Handel’s Messiah, Haydn’s The Creation, and Bach’s Cantatas. She has also performed operatic rôles such as Pamina in Mozart’s The Magic Flute and Bellinda in Purcell’s Dido and Aeneas. She has recorded for Greece’s Radio 3. She is active on the contemporary music scene, working with the IEMA (Institute of Research in Modern Acoustics) as a violoncello player. She has conducted the Symphonic Orchestra of ERT, the Orchestra of the Ionian University, the Orchestra of Modern Music of ERT, the choir of the National Opera House, the Radio choir and small orchestral ensembles. She has taught choral conducting in the Athens Conservatory. Born in Athens, she studied piano and classical singing at the Athens Conservatory. As a scholar of the Onassis Foundation she pursued her vocal studies in Milan, Italy, and in Rome with Renata Scotto as a member of the Opera Studio in the National Academy of Santa Cecilia. She also studied theatre and performance art (Drama school Εμπρός and Attis Theater, the Acting Method of Terzopoulos). As a debutant, she took part in the international young artists programme of the Aegean Opera under the artistic direction of the American baritone Sherrill Milnes. Since then she has appeared regularly on stage performing a wide repertoire ranging from Baroque to contemporary music. She works regularly with Evelina Arapidi and George Stefanakidis (Chromatic Sequence) in the creation of sui generis performances, such as Pietà, an award-winning performance at the AndriyivskyFest International Theater Festival in Kiev, June 2018, and with the avant garde artist and sound designer Constantine Skourlis. Highlights of her career include: playing the rôles of the Sängerin (B. Brecht, National Theatre of Greece), Violetta (Verdi, La Traviata) and Magda (Puccini, La Rondine) in Rome (Accademia di Santa Cecilia), Gilda (Verdi, Rigoletto, Teatro dal Verme, Milan), Queen of the Night (Mozart, The Magic Flute, National Opera of Greece), Micaëla (Bizet, Carmen) and Rosina (Rossini, Il Barbiere di Siviglia) with the Athens Municipality Symphony Orchestra, a recital at Carnegie Hall, N.Y. with the quintet Melos Brass, the artistic direction of the concert cycle A Museum made of Music (Museum of Cycladic Art, 2009-2011) and of the festival Music Tones at Beton 7 (2011-2015), performing Gepopo (Ligeti, Le Grand Macabre) for the workshop of contemporary music (Aristotle University of Thessaloniki), recording the art songs Grafomena by J. Valette (released in 2018), singing Purcell with the counter tenor Michael Chance, performing the Akhmatova Songs by J. Tavener with the cellist A. Liakakis at the Onassis Cultural Centre, taking part in the productions of the RAFI Music Theatre Company (Céphise in Pygmalion (Rameau) staged by P. Mexis, Godmother in Cendrillon (Viardot) and Morgana in Alcina (Handel), both staged by Th. Glynatsis), performing songs by G. Couroupos based on the poems of O. Elytis and Credo by N. Hakim in the “free jazz performance” BSDA by G. Panteleakis, appearing in the movie Matriarchy by N. Kornilios, being a member of the baroque ensemble Canto Soave, having fun in Paris (Phd in semiotics, Sorbonne University), teaching vocal technique at Deree and at Nakas Conservatory. Since 2008 Maira has performed regularly with the pianist Titos Gouvelis, exploring the art song repertoire in its many forms throughout history. Their relationship in music affected them so much that it led to their marriage. Effi Minakoulis was born in Athens. She studied French literature, classical guitar and classical singing and completed her studies with first prize and distinction. With a scholarship from the British Council and the Guildhall School of Music and Drama she furthered her studies at the Early Music Department of the Guildhall School, studying Renaissance lute and theorbo, and singing with some of the foremost professionals of the Early Music scene (Nigel North, Mary Nichols, David Roblou, Emma Kirkby). She holds a MMus in Historic and Systematic Musicology from the National Kapodistrian University of Greece. As a member of various Renaissance and Baroque groups she has performed in all major venues in Greece and abroad and has worked with artists such as Michael Chance, Nancy Argenta, His Majesty’s Sagbutts and Cornets and Eric van Nevel. As a lute player she has collaborated with most Greek orchestras and has participated in many performances of Baroque Operas. She also featured in the performance and the first worldwide recordings of Handel’s Oreste with Camerata Stuttgart and Arianna in Creta, Tamerlano and Giulio Cesare with the Patras Orchestra for the German company MDG, the CD Nativita di Christo containing Italian 17th century music, the CD Lovely Echoes with medieval and 21st century music and the CD Vita Segreta-Musica Segreta featuring Italian music of the 16th and 17th centuries composed by female composers or for female vocal ensembles. As a singer she is active in the Early Music scene promoting vocal music of the 16th and 17th centuries. She has collaborated with the Orchestra of the Municipality of Athens and the Orchestra of the American College of Athens in the performance of J. S. Bach’s Christmas Oratorio and Magnificat, A. Vivaldi’ s Gloria, W. A. Mozart’s Requiem and The Magic Flute, and Verdi’s Traviata. She is a founding member of the vocal ensemble Family Voices, which performs a wide range of creative fusion music and of the ensemble Anima Graeca, which specializes in Greek and Jewish music. She is a member of the professional choir of the Municipality of Athens. She is also active as an educator. She has collaborated with the Athens Concert Hall in the presentation of Sunday Morning Concerts for young listeners. Since 2016 she has been working with the Friends of the Greek Islands and the Sea, organizing and leading interactive musical workshops for children in various islands. She also participates in the planning and presentation of the educational programme of the Orchestra and the Choir of the Municipality of Athens. She teaches at the Music Department of the American College of Greece (Deree College), where she also conducts the ACG Community Choir. Born in London, a graduate of Cambridge University, soprano Diane Sutherland has sung many different repertoires with choirs in the UK, France, Luxembourg, Belgium and Greece. A member of the Brussels Light Opera Company since 1986, she has taken part in numerous operas, operettas and musicals. Her repertoire includes theatre and cabaret. Diane has performed three times at the Patmos Sacred Music Festival. In 2016 she gave a song recital accompanied by the pianist Panos Karan. Diane has extensive experience of improvisation (words and music), writes lyrics, and has recorded 20 albums with the composer and producer Bruno Libert. Special Thanks to The American College of Greece for generously offering the recording studio.